This beautifully upholstered stylish divan adjustable bed comes in a light (neutral) suede surround. The bed comes with the drawer on the right as standard. The drawer can be put anywhere you wish, the choice as always is yours. This bed comes with a full 5-year guarantee. Unlike some other companies, we only sell beds made from the best quality materials. 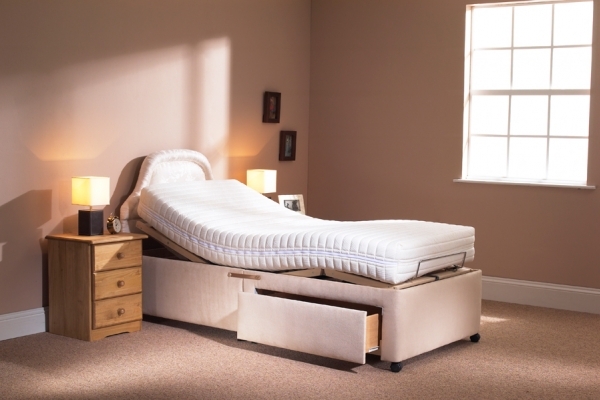 As with all of our adjustable beds, you can sleep on it for up to 7 nights and if you are not totally satisfied, we will fully refund you the cost of the bed or exchange your mattress, free of charge! Standard height for the Winchester is 22 inches from the floor to the top of the mattress without drawer. Beds without drawers can be made to any height. Beds with side drawers have higher minimum height of 24 inches from the floor to the top of the mattress. Side drawers add an extra 2 inches to the overall height of the bed. To make sure the height of your bed is correct when ordering, please measure your own first. We are able to alter your bed to a height of your choice, and all for an extra £75! If you change the specification of the bed it will be a special order (non-stock item) and will take up to 1 week longer to make and deliver. The picture shown is a single bed. The bed also comes in a double or dual.